At least we know Facebook’s European HQ is one of the buildings on the market. 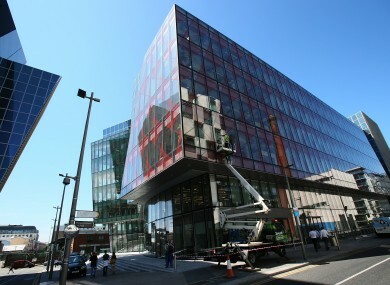 Facebook's European headquarters in Dublin's Grand Canal Square is among the properties NAMA is selling. BAD BANK NAMA will sell five Irish property bundles worth an estimated €600 million over the next three months. Two office portfolios – including dual Daniel Libeskind-designed buildings at Grand Canal Square – five regional shopping centres, and several regional hotels will all be up for grabs. One of the Grand Canal office complexes houses Facebook’s European headquarters after the social media company moved its operations there earlier this year. NAMA also said it was offloading about 600 residential units across seven sites in Dublin as part of the sales binge, but it refused to release further details about any of the properties being sold. Chief executive Brendan McDonagh made the announcement at a Construction Industry Federation (CIF) conference in Dublin, where he said there was strong interest in Irish assets from local and overseas investors. He said the latest portfolios being put on the market would give “enhanced visibility” to the agency’s sales approach, which was to sell assets worth at least €250 million every three months. The vast bulk of the NAMA’s assets are held in Dublin and it plans to build 4,500 new houses and apartments up to 2016, and potentially another 20,000 homes after that. McDonagh said the agency also had a detailed plan for building new offices on undeveloped land in Dublin’s docklands area, where it owned 75% of the unused property. It has two sites in the advanced stages of development planning at Boland’s Mill and North Wall Quay. The agency has previously outlined its scheme for a €200 million residential and office complex to be built on the derelict Boland’s Mill site. A similar plan is in place for the North Wall Quay property, which neighbours the half-completed complex NAMA sold to the Cental Bank of Ireland for the bank’s new headquarters at a price of €7 million in 2012. Email “NAMA is selling €600m in properties - although it won't tell us exactly what”. Feedback on “NAMA is selling €600m in properties - although it won't tell us exactly what”.